Planning A Winter Wedding In Raleigh? 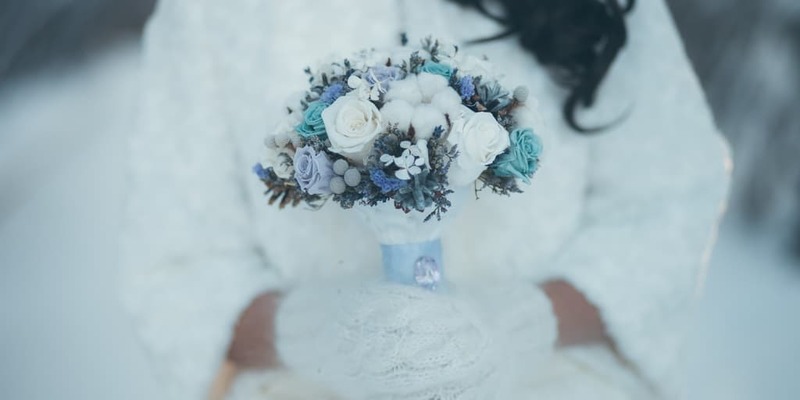 If you’ve been planning a December, January or early February Raleigh wedding, you may have automatically veered toward white as your go-to option for winter wedding colors. After all, doesn’t it make sense to pull in the natural colors of the season into your theme? But the thing is, if you’re getting married in the south, you don’t have to limit your winter wedding to white, sparkly white, and ivory. This isn’t upstate New York after all – we don’t see our first dusting in late October. Heck, most years it hardly snows at all! Here in central North Carolina, our mild winters offer up a whole host of deep, rich colors. Why not leave the white for the wedding gown and weave some of these colors through your big day instead? Look around the winter landscape in North Carolina and you’ll see plenty of bright reds, rich browns, and deep, earthy greens. Infuse your wedding with the beautiful colors of our hardy holly bushes and magnolias. And while you’re at it, ask your floral designer to incorporate the actual greenery into your wedding bouquets and tent drapery. These plants have the benefit of being extremely hardy – they’re ideal for using in your floral architecture. Pink isn’t just for spring. That’s because another plant you see quite a lot of here in Raleigh are camelias. These perennial favorites bloom throughout the winter season in big, multilayered, velvety pink and red blooms. Think about ombre attendant dresses, and mixing white table coverings with rich, pink linens and chair coverings. Raleigh winter gardens and porch planters are often filled with mass groupings of pansies, ornamental cabbage, and lenten rose. That’s because these delicate looking plants offer pretty yellows, purples, blues, and reds while being plenty hardy enough to survive the occasional snowy weather. And come February, yellow crocus and daffodils and purple hyacinth start to pop up from bulbs planted in early September. Why not plan your wedding colors to match? Mix saturated yellow tones with small pops of purple and maroon. Or what about a wedding cake with purple and yellow icing pansies? Whichever of these beautiful color combinations you might choose, J&J Tent and Party Rentals has rental items that will help provide you the materials needed to achieve a beautiful, memorable event. From tent and arch rentals that provide the architecture for beautiful floral drapings, to linen rentals in a multitude of color choices, to the perfect chair selection, call us to see how we can make your winter wedding a warm, inviting, unforgettable event!